What is an All Terrain Double Stroller? Being a first-time parent is tough. Being a second-time parent, however, can be even harder. Suddenly, your attention is split between two different kids with unique sleep schedules, foods, clothes, and demands. A high-quality all-terrain double stroller is a valuable tool for any overwhelmed set of parents. With all the attention and time needed to corral and care for two (or more) kids, finding time to properly research the best all terrain double stroller can seem impossible. In fact, it can be hard to find the time to research why you’d even need an all-surfaces double buggy. 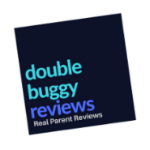 We’ve pulled together a succinct, but thorough, all terrain double strollers review to save you time and help you understand why everyone’s raving about these wonderful buggies. As this all terrain double stroller review will show, this option is tougher and larger than the average dual pushchair. They usually clock in at about 13.6kg (30lbs.) and feature incredibly tough designs intended to take on cracked city streets, boardwalks, trails, beaches, gravel driveways, snow, slush, grass, and other mild surfaces that are too rough for a typical stroller. All Terrain Intention: Between the structure and tires of the buggy, an all-terrain stroller is designed to put in some serious work. These prams are great for long walks or mild jogging either on pavement or off-road. Variety of Designs: All-terrain strollers usually come with a variety of different designs to best fit the needs of the parents. Comfort: Given the size of these strollers, the seats are usually wide and plush to accommodate larger kids comfortably and safely. Durable: Since they’re designed to take on rough surfaces, the all-surface strollers last a long while before showing signs of wear or needing to be replaced. Maneuverability: These buggies can come with a single or dual front tires, and each design offers distinct advantages. Unique Features: Some prams come with unique features that no other option has, like reversible seat liners or weather shields. Adjustability: Buggies come in a wide range of adjustability. Some have an adjustable handlebar; some have independently reclining seats. Weight Limit: Some pushchairs can handle heavier kids than others. Weight limits usually range from 31.75kg to 45.35kg (70lbs to 100lbs). Stroller Weight: Some may be designed to be as light as possible (around 11kg or 25lbs), while others focus on stability and come in around 18.14kg or 40lbs. The biggest perk of this stroller is the low-price tag. It maintains the same strength, durability, and safety as the high-cost buggies at a fraction of the price by exchanging small, expensive components (often inconsequential materials) with more affordable options. The tires on this pram are made with the same material as bicycle tires, which allow for the all terrain maneuverability with less cost. This product also features an under-seat storage compartment divided into two sections, independently adjustable seats, and an easy to fold and unfold design. This stroller has one glitch in its design: the front tire is wobbly and shaky at high speeds when unlocked, but when placed in the lock position, the issue isn’t present. All in all, it’s lightweight, portable, and a great option for the family on a budget. This buggy is the handiest and the easiest to fold in a hurry. The one-handed fold design makes transitioning from sidewalk to trunk quick and simple, even while multitasking or holding a child. The weather shield is a unique benefit we hadn’t seen on any other option, and it came in handy to keep kids safe and dry during rain. The Baby Jogger is great at gliding over rough surfaces, such as gravel or beaches, without shaking or jostling the kids sitting inside. It features a fun glider board that allows older kids to hitch a ride and safely stand on the attached step between the handlebar and driver. The hand brakes on this option aren’t messing around; they offer a quick stop, even while jogging, and made this stroller flip-flop friendly. Though this stroller is a bit more expensive, you get what you pay for—the Baby Jogger is strong, reliable, and sturdy. This stroller is notable for its skinny design. The mountain buggy still has all the strength and versatility of a typical all-surface buggy, but is the same width as the average single pram. With this feature, it can fit through most doorways and be better navigated in busy areas. The seats are independently adjustable and the handlebar can be set anywhere from 31 to 42 inches (78cm-106cm) high to accommodate almost any parent or driver. It is light and easy to transport when folded, and the fabric of the seats are reversible, allowing for easy cleaning. It is important to note, however, that the slim design means that the seats are narrower than the typical pram, and bigger kids might have some difficulty. This buggy is great for active urbanites who need a stroller that’ll do double duty in every-day errands and in/off-road adventures. As the best all terrain double stroller reviews have shown, these buggies are adaptable and powerful. They’re like the Swiss army knives of pushchairs; they can tackle a wide variety of surfaces, can be used for jogging, or can be used for travel. It’s a great auxiliary pram for the family on the move. They come over a wide array of budgets and more models are constantly becoming available. Make sure you do your research and find the best all terrain double stroller for your family. All-surface double buggies are a perfect fit for a life on the move, and adding this tool to your arsenal will be a move you certainly won’t regret.